This seafood shack is nothing short of extraordinary. When it was time for a new take-out restaurant on the town dock in Castine, the town lucked out. “We wanted fresh food, fresh ideas, and fun,” said Town Manager Jimmy Goodson. And that’s exactly what the town got in Dudley’s Refresher, opened by Michael Rossney and Michelle Levesque, the couple behind the award-winning El El Frijoles on Route 15 in Sargentville. Now in its third season, Dudley’s Refresher is thriving. This is a food pro who insists on tortillas shipped from Pachenga in Portland, oysters from the Bagaduce River, Pineland Farms beef, and 30 Acre Farm’s sauerkraut. The ice cream comes from Morton’s Moo in Ellsworth. Fruits, vegetables, and garnishes come from Horsepower Farm in Penobscot and various farmers’ markets. It might be the only seafood take-out shack in Maine serving a gourmet fiddlehead burger, dreamed up by the new chef de cuisine, Brad Buck. To move away from the earthiness of the fiddleheads, he added fig, lemon balsamic, sage and classic butter. This is not your average dockside take-out burger. 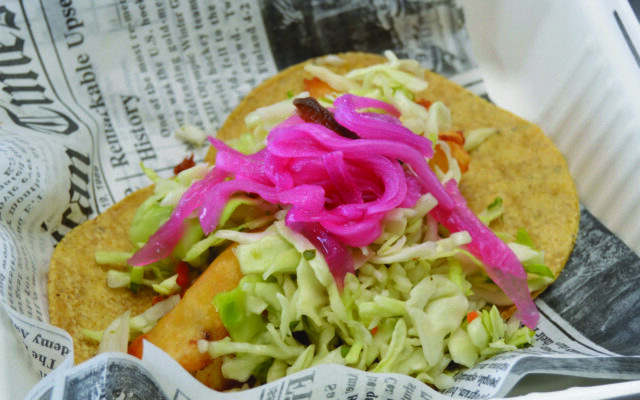 The fish tacos have been legendary since opening day. The location and diminutive building may suggest burgers and fries, but just wait until you pick up your order and see the size of the individually assembled, fresh lobster roll. The haddock sandwich, with a sriracha rub tucked under the traditional crunchy beer batter coating, could feed a family. And how about some poutine? It’s all about local, fresh, and innovative. This summer look for house-made shortcakes with blueberries and strawberries, a nod to Buck’s interest in baking. Also, there’s Michelle Levesque’s famous gluten free macaroons dipped in chocolate. In year three, Dudley’s isn’t resting on its laurels. Their classics are still flying out the door. The menu experiments are meeting approval. Sure, this restaurant is off the beaten path — something Rossney readily admits — it’s worth the trip.